Happy New Year of the Dragon (soon…) & Hello from Sydney! Wishing all our members, followers and supporters a great new year for 2012 and soon for the Lunar New Year of the Mighty Dragon! 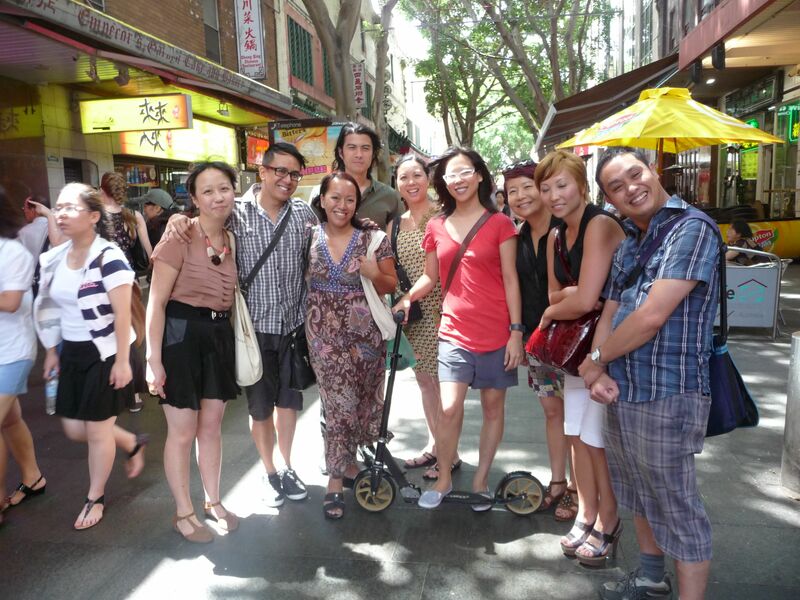 It’s fitting that our very first event for the year on 5 January 2012 was at the dragon gates of Sydney’s Chinatown, where the AAFFN held a casual catch up with a number of our Sydney based speakers from our inaugural event last year, plus a few new faces. The meeting was attended by Asian Australian actors, producers, directors, a photographer/composer, academics and a theatre artist/documentary maker. A special highlight for all was seeing Annette Shun Wah, our keynote speaker from the AAFF2011, who reminded everyone to make use of the Performance 4A Asian Australian performance directory. It’s free and has resulted in a number of gigs for folks. Additional thanks to the wonderful Yu Ye Wu, arts worker at ICE and 4A Art Centre, who suggested we all try out the new ‘MEET FRESH’ dessert bar for discussions about acting, directing, funding, studies and various ambitions for the year ahead. Additional thanks to Michael ‘Tokyo Love In’ Chin for photographing (with his enviously lovely Leica camera) our meet up – pictures posted on our FB Album here. Pictured above – Fresh 2012 new year meet up with Yu Ye Wu (ICE and 4A Art Centre), Mike ‘Tokyo Love In’ (Plum Jungle), Max Brown (Actor), Indigo Willing (AAFFN co-founder, UQ academic & community facilitator), Joy Hopwood (Joy House Productions), Pearl Tan (Pearly Productions), Annette Shun Wah (Performance 4a), Hee Ra Heaser (UNSW) and Dominic Golding (Theatre, Monash). Also at gathering: Karen S. (Scholar) and Jiao Chen (Staple Fiction). Pic by Karen. Sending apologies: Amadeo Marquez-Perez (AAFFN Co-Founder & Bayside FF), Francis Maravillas, Quan Tran, Maria Tran, PJ Madam and Julie Koh + AASRN’s Tseen Khoo. Other Sydney news to start of a vibrant year was the screening of WONDER BOY’s director Corrie Chen’s latest short, Bruce Lee Played Badminton Too which featured in the Australian program 2 on 6th of January at Bondi Pavilion. Fans can now vote online, also giving the voter a chance to win $100. Beginning 8 January was SBS’s new 3 part documentary ‘Once Upon a Time in Cabramatta‘ (screening now, 2nd part shown next Sunday 15th). Researchers on the program included Maria Tran (also see Brisbane below for other news). AAFFN co-founder Indigo Willing has been attending meetings and in contact with film folks post-November event via online, but also hoping to find some Brisbane locals. A quick shout out to a couple of great dinner guests, Maria Tran (visiting from Sydney) and Sukhmani Khorana who joined Indigo Willing for dinner 4 December in South Bank last month for a catch up on their various projects. Maria Tran, director, writer and actor, is currently working on the feature film ‘Quest for Jackie Chan‘, due 2012, and was a researcher on SBS’s 3 part documentary ‘Once Upon a Time in Cabramatta‘ (screening now, 2nd part shown next Sunday 15th). Sukhmani Khorana is a Brisbane based academic & documentary filmmaker, who recently presented at the Asian Australian Identities conference that was affiliated with our inaugural Film Forum event in Melbourne, and is the author of Ethnic Diversity on Australian Television published in Kill Your Darlings literary journal. You can also view her doc. on vimeo below. Additional thanks to Michele Thistlewaite-Di Lauro, lecturer at Griffith Film School, for providing a tour on 9 December of the school’s sound stage, cinema and labs to discuss future possibilities for potential workshops and screenings for Asian Australian filmmakers and community members interested in storytelling. AAFFN co-founder Amadeo Marquez-Perez has been traveling, including for work doing video-making workshops with various communities in rural and regional areas, and city-side and online has also been in contact with local film folks post-November event. A quick shout out to Melbourne locals Somchay Phakonkham who has been busy working on his next film ‘The Boat’, Min Tran who is working on his next horror movie ‘The Hospital’, Chris Pang who you will soon see in ‘Quest For Jackie Chan’ amongst other projects, the ‘Footscray by Night‘ team (Hoang Tran Nguyen, Community Artist: David Cuong Nguyen, Emerging Filmmaker: Tinny Tang, Choreographer: Demi Sorono, M.C. : Bruce Vu, and Bin Le) for their successful community event, and everyone else based there who we’ve worked in various capacities. Posted on 13/01/2012, in Uncategorized. Bookmark the permalink. Leave a comment.